Individualised patient treatment approaches demand precise determination of initial disease extent combined with early, accurate assessment of response to treatment, which is made possible by positron emission tomography/computed tomography (PET/CT). PET is a non-invasive tool that provides tomographic images and quantitative parameters of perfusion, cell viability, proliferation and/or metabolic activity of tissues. Fusion of the functional information with the morphological detail provided by CT as PET/CT can provide clinicians with a sensitive and accurate one-step whole-body diagnostic and prognostic tool, which directs and changes patient management. Three large-scale national studies published by the National Oncologic PET Registry in the USA have shown that imaging with PET changes the intended patient management strategy in 36.5% to 49% of cases, with consistent results across all cancer types. 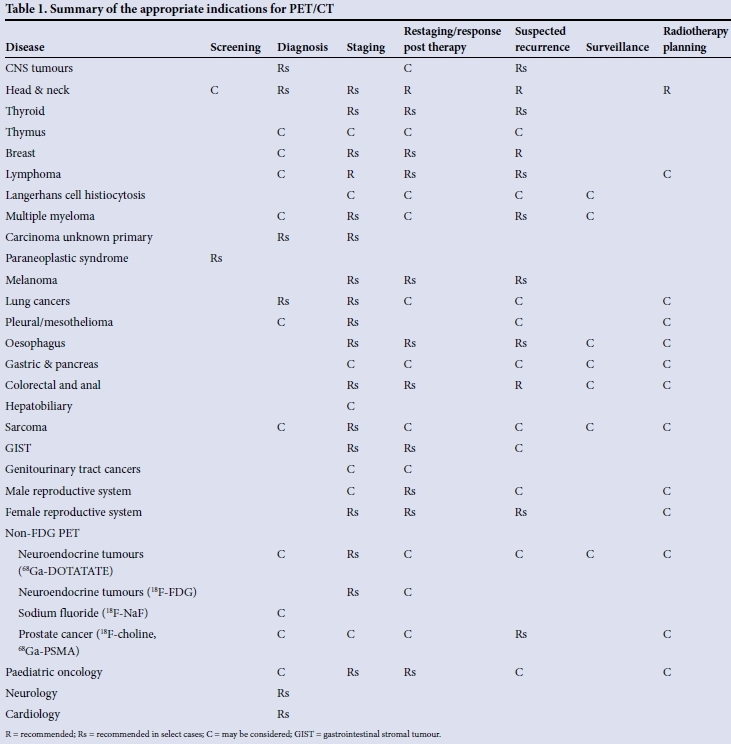 The proven clinical effectiveness and growing importance of PET/CT have prompted the College of Nuclear Physicians of South Africa, in collaboration with university hospitals, to develop a list of recommendations on the appropriate use of fluorine-18-fluorodeoxyglucose (18F-FDG) and non-18F-FDG PET/CT in oncology, cardiology, neurology and infection/inflammation. It is expected that other clinical situations will be added to these recommendations, provided that they are based upon solid clinical evidence. These recommendations are intended to offer advice regarding contemporary applications of PET/CT, as well as indicating novel developments and potential future indications. The CNP believes that these recommendations will serve an important and relevant role in advising referring physicians on the appropriate use of 18F-FDG and non-18F-FDG PET/CT. More promising clinical applications will be possible in the future, as newer PET tracers become more readily available. Several studies have demonstrated the superiority of combined PET/CT over either modality alone, and for many indications this is generally accepted as the gold standard for imaging in oncology. The value of PET/CT imaging has been best demonstrated in the setting of oncology with the use of fluorine-18-fluorodeoxyglucose (18F-FDG). FDG is an analogue of glucose and is taken up by cells via the first stages of the normal glucose pathway and trapped inside cells with high glucose transporter expression and/or glycolytic activity. Tumour uptake therefore correlates with tumour growth and viability, providing metabolic quantification and frequently useful information for tumour characterisation, patient prognosis and monitoring of therapeutic response. imaging resulted in a change in intended treatment plans in 50% of cases.In up to 90% of cases, referring physicians indicated that PET/ CT enabled them to avoid additional imaging tests or procedures. It is largely on this basis that PET can significantly reduce the number of tests performed, with substantial healthcare savings if it is done at the beginning of the diagnostic pathway rather than as a last resort. PET imaging has enabled physicians to avoid costly biopsy and surgery in as many as 70% of cases. This can also result in significant cost savings and prevent patients from undergoing high-risk surgical procedures. South Africa (SA) is recognised as a world leader in the provision of medical isotopes and has centres of global excellence in PET for oncology, infection, neurology and personalised medicine. SA is among a minority of countries that can provide both 18F-FDG and non-18F-FDG tracers, including 18F-NAF, 18F-choline, 68Ga-DOTATATE/DOTATOC, and 68Ga-PSMA for clinical use. We have already observed the significant clinical impact of 18F-FDG PET/ CT in the management of cancer patients, similar to that published by Hillner et al. [6,7] and Worsely et al. Evidence is also rapidly accumulating for multiple non-oncological indications in the fields of cardiology, neurology and infection imaging. This growth is expected to continue with existing tracers, and with the numerous possibilities created by new tracers. The proven clinical effectiveness and growing importance of PET/ CT have prompted the College of Nuclear Physicians (CNP) of the Colleges of Medicine of South Africa, in collaboration with university hospitals, to develop a list of recommendations on the appropriate use of 18F-FDG and non-18F-FDG PET/CT in oncology, cardiology, neurology and infection/inflammation. This has resulted in a well-established list of recommendations on the use of both 18F-FDG and non-18F-FDG PET/CT in these fields. 1. Recommended: PET/CT is generally appropriate for this indication. There is a strong base of evidence supporting its use and/or it is currently recommended by international clinical guidelines. 2. Recommended in select cases: PET/CT is appropriate for this indication in cases meeting clearly defined criteria. In this specific context there is a strong base of evidence supporting its use and/or it is currently recommended by international clinical guidelines. 3. May be considered: PET/CT is generally not appropriate for this indication; however, it may be appropriate in individual cases with a strong motivation. Typically there may be some evidence or a strong rationale to support the use of PET/CT in special circumstances. 4. Not recommended: PET/CT is generally not appropriate for this indication. Typically there is a low level of evidence and/or weak rationale for its use, and it is not endorsed by international clinical guidelines. The recommendations and practical guidelines developed by the CNP for the use of 18F-FDG and non-18F-FDG PET/CT are summarised in Table 1, and the full details will be available in part 2 of the January 2016 issue of SAM/. It is important to note that it is expected that other clinical situations will be added to these recommendations, provided that they are based upon solid clinical evidence. Although the availability of metabolic functional imaging has greatly enhanced our understanding of a range of pathological processes, and provided new opportunities for incorporation of this information into patient management protocols, growth of PET globally and in SA is constrained by cost, infrastructure and education. The World Heath Organization recommends that countries adopt a PET scanner ratio of two scanners per million people. This suggests that SA would require approximately 100 PET scanners - ten times the current number. Attaining this goal would require a financial commitment commensurate with policy priorities that include resources for equipment, radiotracer production and distribution, infrastructure, and the education of physicians and healthcare consumers. Currently this is not achievable. The cost of PET/CT in SA ranges from ZAR12 000 in the public sector to ZAR20 000 in the private sector. With the limited resources we have, it is therefore important to avoid the inappropriate use of PET/CT. The limited knowledge of PET on the part of many referring physicians is a growing concern, and is a commonly cited factor contributing to the underutilisation of existing PET scanners in some departments. SA doctors tend to use PET imaging at the end of the diagnostic pathway, which may prevent cost-effective care. Similarly, the inappropriate use of PET/ CT is not cost-effective. There is therefore a need for education and training of caregivers, doctors, patients and healthcare officials. The CNP recommendations'191 are intended to offer advice regarding contemporary applications of PET/CT, as well as indicating novel developments and potential future indications. The CNP believes that these recommendations will serve an important and relevant role in advising referring physicians on the appropriate use of 18F-FDG and non-18F-FDG PET/CT, which can be a powerful tool in patient management in oncology, cardiology, neurology and infection/inflammation. More promising clinical applications will be possible in the future, as newer PET tracers become more readily available.